Wondering how much it will cost to remodel a bathroom? Here I share what you need to be prepared for financially in any bathroom renovation. Bathroom renovations and remodels come in all shapes and sizes causing budgets to vary greatly. Especially when it comes to construction and materials. The major cost of a remodel is driven by 3 major things: labor, materials, and decorative accents. We are going to go into detail about bathroom remodel costs and other expenses you need to factor into your budget. Plus how to get the look of porcelain slab for less! First, welcome back to the 2nd week of my One Room Challenge master bathroom remodel! Week 1 can be found here. 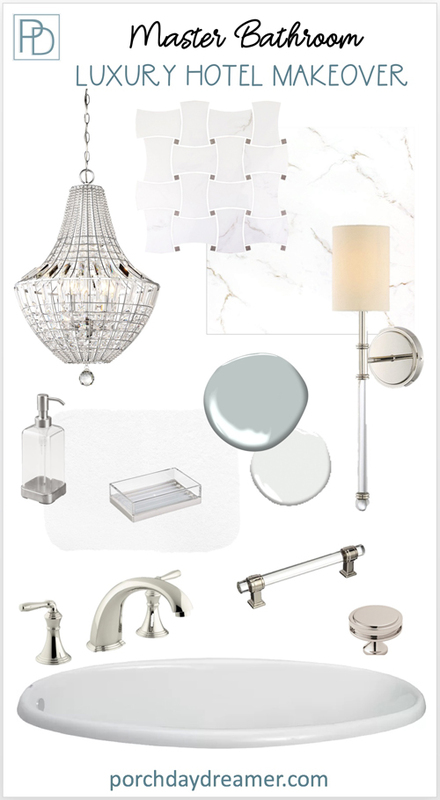 The scariest part of deciding to makeover the master bathroom room was finding the budget to cover all of it! I’m going to share with you the not so nice side of a remodel, which is the cost. Pulling back the curtain on money is always risky, but my intent for doing this is to help you with your own budgeting process. 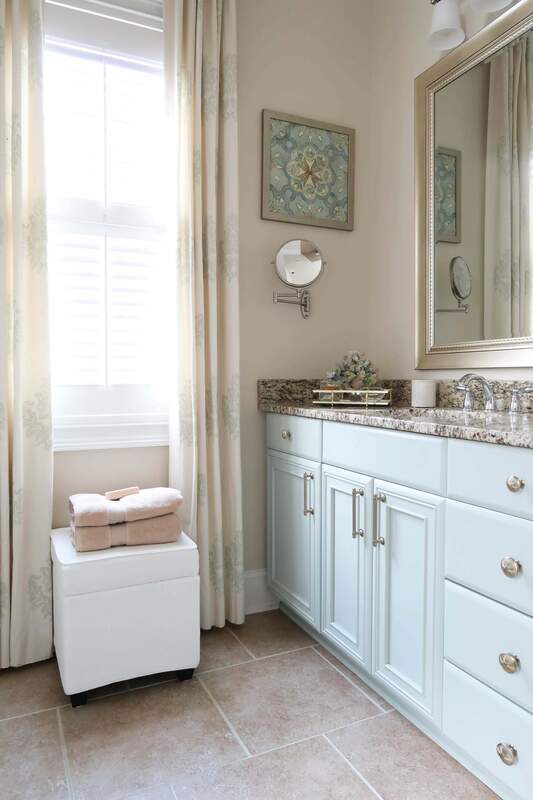 Remodeling a bathroom can be done inexpensively, like how I made over my powder room. But based on the design plan, this master bathroom remodel is going to require higher end materials and a LOT more labor. For perspective, my master bathroom is 15 ft long by close to 10 ft wide. Both vanities are 5 1/2 ft wide. The shower is a nice size at 4 ft x 3 ft, along with the tub area at 5 ft x 3 1/2 ft.
It’s a very long and narrow space that would be considered a medium sized bathroom. First, start combing Pinterest and magazines for inspirational images. Come up with a VERY clear idea of what you want to do in your bathroom. That way when you meet with a designer and/or contractor you can make sure they quote everything upfront. It’s not to say you won’t add items as you go, but you want to be at least 95% sure on the plan before you put down a deposit with a general contractor. My best advice is get THREE QUOTES to know how much the labor will cost up front! Make sure to get references, before you decide to go with a contractor. Yes! Labor is THE most expensive part of a renovation. Trade skilled labor is worth the money, but if you want to save money you can always hire relatives or do it yourself. My master bathroom remodel will not involve major construction like tearing down or building walls, so factor that into these general cost guides. Plus I plan to keep the vanities in place to save money! 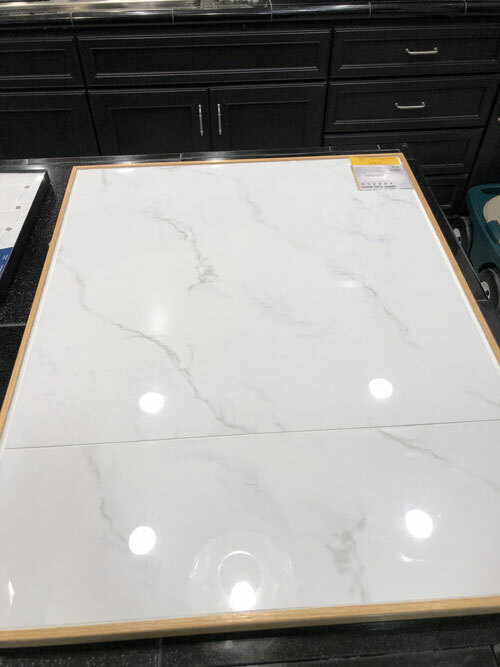 Tile and countertop prices swing drastically, so my advice is get the look you want at the lowest price (we will talk more about that later). 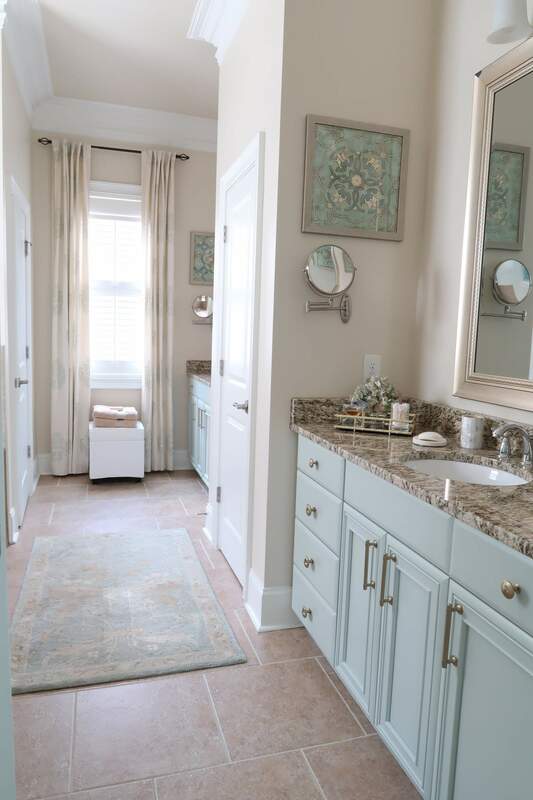 To do a master bathroom remodel similar to mine will cost well over $20,000. Some of you may have sticker shock and some of you may say that’s affordable! I had TOTAL sticker shock thinking it would be about $15,000 to $18,000 all-in. I must bring this up because these items are a blind side to most people – including me! The valves are specific to the faucet fixtures, so I had to buy Kohler valves for my faucets. Add another $300 to $500 to your budget. Then you need to think about what you will keep or what you will replace and this list gets LONG. These are the pretty things! All of these “little things” add up very quickly! Reusing what you have or doing some of the installation of light fixtures or painting can save as well. To save about $1,000, I am painting the cabinets myself and installing the hardware. As far as the “pretty stuff”, I decided to replace all of it! Hover over each item to get an idea of cost. Luckily, most of these items can be purchased overtime to help spread out the expense. The two most expensive items out of the replacement costs were the tub and the plumbing fixtures. However, I got a MAJOR deal on the tub. Total cost of the “pretty things” is another $3,000 to $4,000. Yep! Phew! To spread out the budget, I installed the counters 4 months before I started the full renovation. Over the course of 3 months, I bought most of the “pretty things”. Then the labor is paid in installments, with the glass shower surround being the last big expense. This is where I worked to get a very high-end look at the most affordable cost! 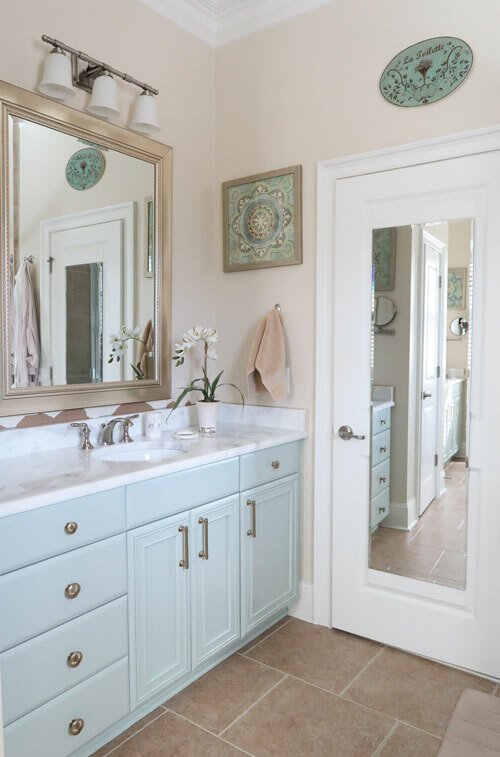 Have you ever seen a bathroom on Pinterest that makes you drool? As I was looking for inspiration, a bathroom designed by Bria Hammel stopped me in my tracks one day. What I LOVED is how there were no grout lines and after digging learned that she used porcelain slab to achieve this look. 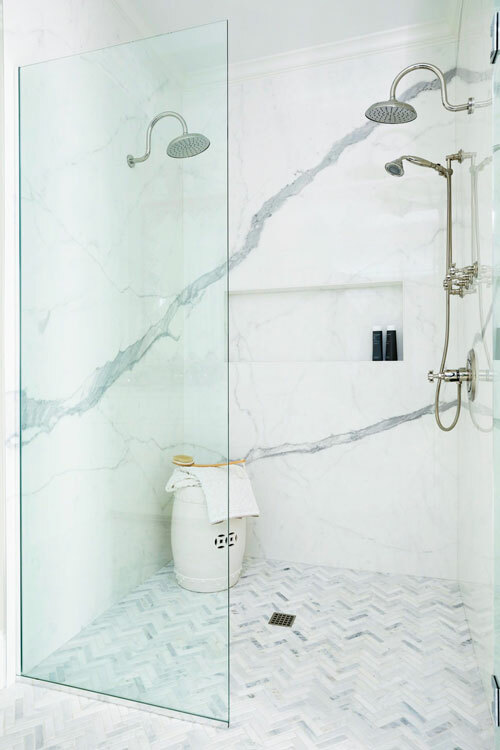 I started searching for porcelain slab yards, to see if I could do this in my bathroom. 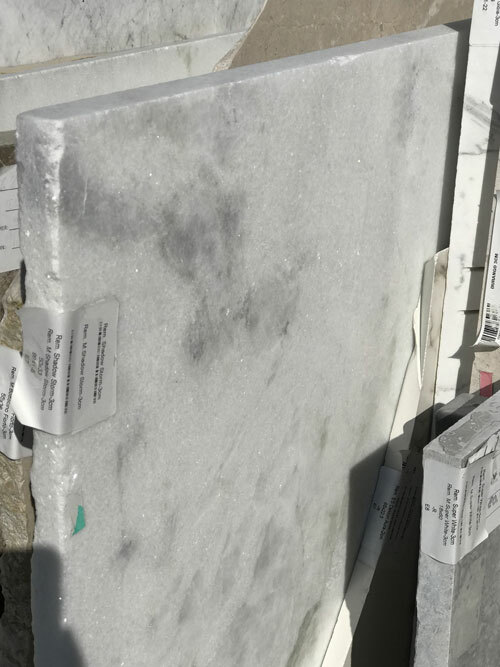 Luckily, one yard had a slab for me to look at and it’s gorgeous very much like a slab of natural stone. To my dismay, I found out that to specify porcelain slab in my shower was going to be somewhere between $150 to $200 per SQUARE FOOT! That was not in the budget! So I immediately got in my car and went to The Tile Shop! 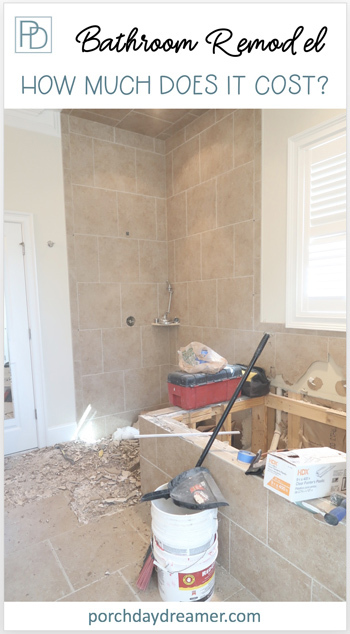 Sharing the bathroom pictured above with the designer, we found the LOOK of slab in a great large format tile. Instead of using the 12 in x 24 in version, I opted for the 24 in x 24 in version in Calacutta Bianco Gloss Porcelain Tile. With 1/16 inch grout lines, I was going to get the look of slab for $5.99 per sq. ft. or less! Now that’s in the budget. 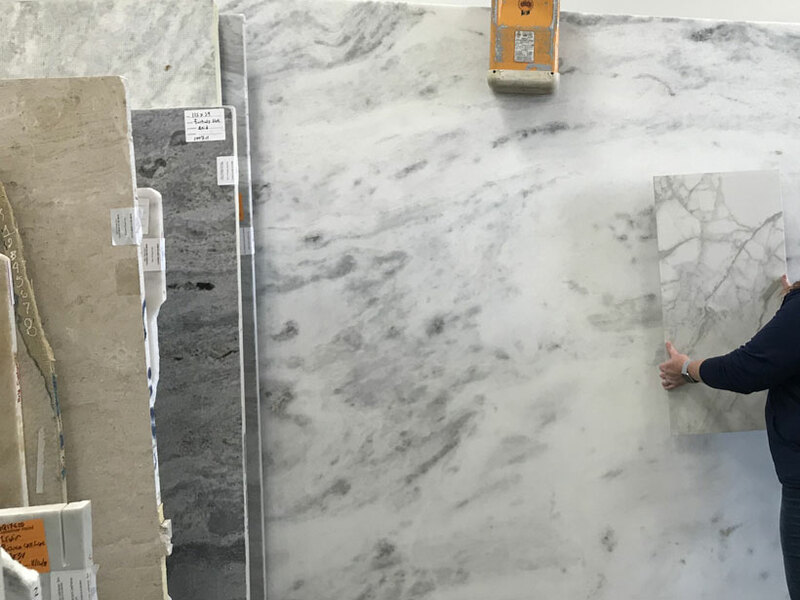 You may be surprised after reading No Way I Was Using Marble in the Kitchen! that I decided to use marble in my master bathroom! I won’t be drinking wine, coffee, cooking or cutting lemons. So with a little sealer and care, I feel safe using it in this application. 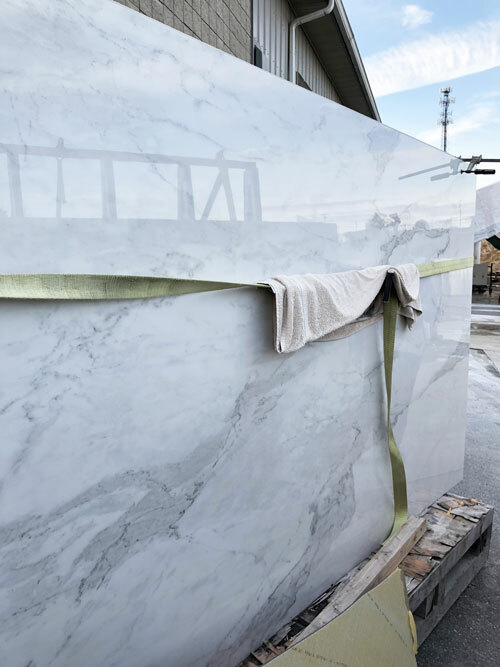 Luckily, I found a great source of help hiring Lisa of A House by the Lake Interiors to help me navigate slab yards and fabricators. We found this gorgeous slab of Shadow Storm that was a little unusual with warmer sections and the perfect option for my design vision. Shadow Storm marble has a crystalized look and sparkles in the sun! A great addition to my sunny bathroom. Marble can be more affordable than quartz, so this allowed me to not only do marble countertops but also a marble deck on the tub surround. 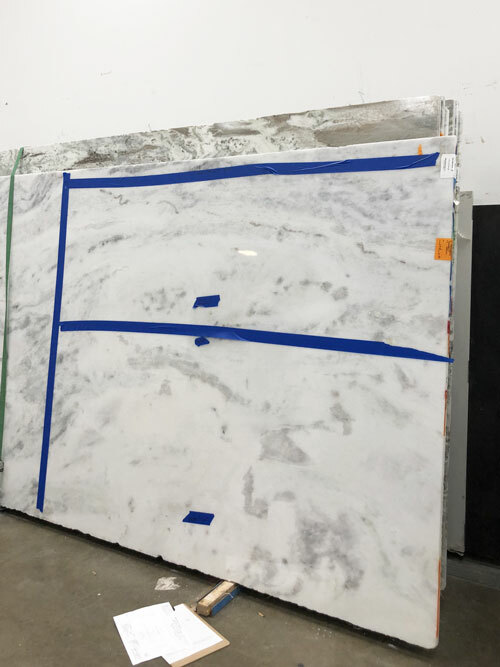 The best advice I can give you is to ALWAYS go to the fabricator and layout your counter template on the marble. You will be staring at this counter every day, so you want it to be perfect eliminate dark spots or areas of the marble you don’t want to emphasize if possible. Here is a little sneak peek of the new marble. You can see I experienced some damage to the wall when removing the granite, but it is easily repaired. Just the counter update brightened the room! 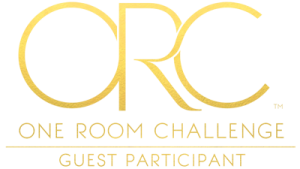 Now it is time to visit all of the other featured and guest designer’s progress during this second week of One Room Challenge craziness! Next week, I’ll be sharing the demo progress and final paint colors plus the flooring tile! I’m curious – don’t you have “sponsors” who are paying for most of this renovation? I have a few products like the cabinet hardware and bath mats that were donated, but I am paying for the rest. Lots of amazing tips! Can’t wait to see what you come up with!